On a related note, I just found a GUI-builder for Ext. Wow, that's really neat! But one things that I've learned in my journey - and the 1 week well-spent time that Bunkai took - is that coders want source to feel comfortable. That's why I had the communicating windows src <-> render where changes goes both ways. It is a bit like the ext gui builder, but can import MySQL databases (or WSDL) as services, with a live layout, with Dojo 1.0 as front-end. Pretty much like the Gui builder otherwise. Too true about the src<->render. I feel tha same way. Until I think about it. However, I've yet to see a GUI-builder that actually produces code that makes sense. So, instead of focusing on two-way covariance, perhaps it would be better to have the builder produce nice event hooks and then hide all the generated source. It is a matter of taste of course but I'd rather have a GUI-builder that shielded me from the widget library. If I actually know a library I can always beat a GUI-builder hands down in speed and nice code. I think that is what made Visual Basic what it was. You didn't actually need to know what all the panels and stuff did. How events propagated and so on. 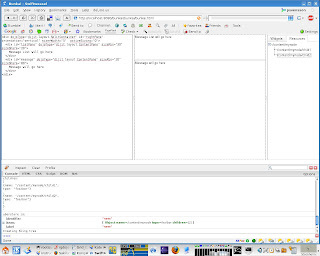 Now, take Swing and Matisse (in NetBeans) which is probably the most advanced GUI-builder for Swing. It never fails to completetly break down if I change as much as a single line of the generated code. The problem domain (Swing) simply offers too many permutations of code to be able to create a robust builder. Better then, I say, to hide as much of the generated source as possible. Well, tastes are different, I even change my mind on this topic about once every week. I also feel that one of the largest problems the visual builders face is to generate good code, be it html, js, java or what have you. I did a horribly complicated stint which was fairly hard to use and looked ugly, last year. And when I tried to dig down to why it wasn't well received I realized that programmers (including myself) are very literal people. We know the magic words, and how to (hopefully) put them in a row to make things happen. So a visual builder is in some ways an anathema tothe very core of a programmer, because it hides what is happening. That means that even though a visual build tool would be very helpful to a coder, it also makes him (me) nervous) by hiding what's going on. By exposing changes done visually as immediate code changes as well, I think that you can achieve some kind of trust level with the programmer as he/she tries out the tool the first time. Otherwise I feel that there's a risk that the tool, no matter how beautifully done (I have no experience with that, I'm just extemporizing :) will be given just a cursory glance, and then be left behind. I'm talking from a kind of marketing standpoint I guess, even if I'm leaning towards open sourcing things in the end. But I think that the Ext gui builder (which I've fiddled some more with, and like the more for it, actually) could show source changes with so much effort, depending on how much of a metadata model they've build under the hood. That was one of the first design choices with Bunkai, actually, to use just source as the 'metadata'. So that there's nothing there which isn't in source. Of course, I'm lying a bit, because Google API's have to be preloaded, and there's a whole page for the widgets to live in, et.c. But that's the basic approach.